Fertility Charting Made Easy - Chart Online or Download the Mobile App. Powered by the latest scientific research and utilizing Toni Weschler's three decades in the field, OvaGraph is designed to help you take charge of your fertility naturally. CHART all of your fertility indicators. 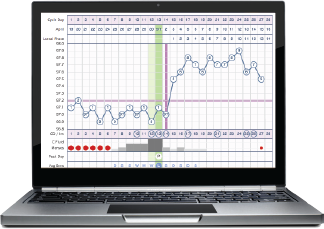 Color-coded fertility charts display all your menstrual data - basal body temperature (BBT), cervical fluid and position, OvaCue readings, and much more. LEARN from your body to improve your chances of conceiving. Your cycle data will be interpreted to help determine your ovulation date, fertile days, and cover line. SHARE your TTC journey and benefit from experienced moderators, helpful articles, and an active and supportive community. Know your 'Trying-to-Conceive' lingo - the fertility world is full of acronyms. Read our list of the most popular fertility acronyms. Psychologist Meg Jay on knowing your fertility in your twenties to help your future family.